1999-2004 Cobra Mustang, MM3 Race series damper package for IRS Mustang, includes two MM3 Race struts and two MM3 Race shocks. Intended for track-driven IRS-equipped Mustangs with front coil-over spring rates of 450 lb/in to 500 lb/in and rear coil-over spring rates of 650 lb/in to 700 lb/in. Intended for lowered cars; the strut mounting ears are relocated on the housing to increase bump travel. Offered exclusively by Maximum Motorsports for open-tracking and wheel-to-wheel road racing. The MM3 Race series dampers are intended for track-driven Mustangs with spring rates higher than the rates compatible with the MM2 Race series dampers. Constructed with the highest-grade materials and extreme attention to detail, Maximum Motorsports manufactures the finest dampers possible. MM3 Race series struts and shocks are the perfect choice for a car that sees aggressive open-tracking, time trials, or wheel-to-wheel racing. 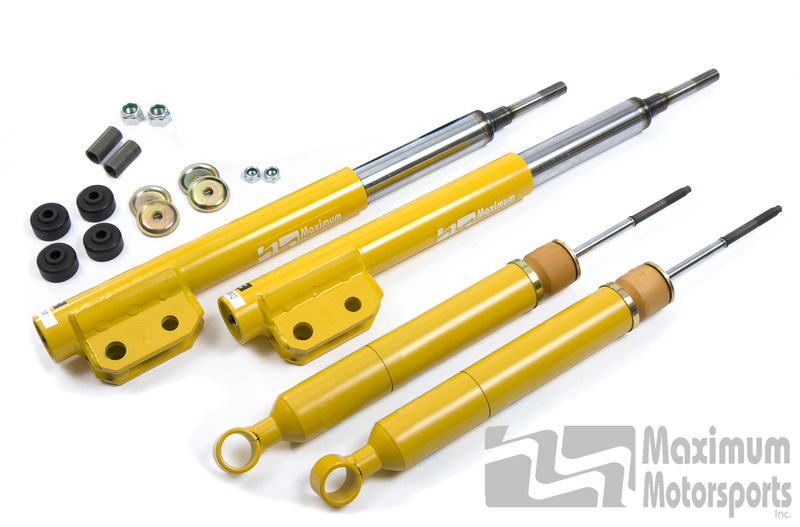 Designed to control the coil-over spring rates required for on-track performance, the MM3 Race series struts and shocks are intended for a track-driven cars equipped with coil-overs. The MM3 Race series rear shocks are ready to accept the MM rear coil-over conversion kit; they are manufactured with the groove in the shock body that is required by a coil-over conversion kit. All MM3 race series struts feature unique proprietary strut housings with high-strength, relocated mounting ears. These mounting ears prevent the possibility of bending as a result of brake-torque reaction loads. The mounting ears are relocated to increase bump travel on lowered cars. All MM3 Race series rear shocks come with an integral, progressive bump stop.